Growing up on television is rough. Ask anybody who had to do it. There's this pressure to constantly remain young, precocious, charming, and completely frozen in amber for as long as possible. But at the same time, you have agents and managers and parents (who might also be your agents and managers) constantly ushering you toward the next job. The next moment in your career to keep the gravy train going. You are expected to remain completely unchanged for your television character, and yet you are unreasonably asked to grow as an artist and explore your talent in new and exciting ways in movies or other TV shows, or a music career, et cetera. It's a terrible message to convey to someone most likely going through the most elastic of emotional and physical changes in their life. Michael J. 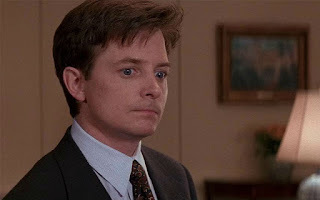 Fox, who got his start on 1970s CBC sitcom "Leo and Me," forged himself a real double-edged sword through the 1980s as both Alex P. Keaton, NBC's charismatic adolescent Gordon Gekko on "Family Ties," and as intrepid teen time-traveler Marty McFly in Back to the Future. By 1991, he had gone through seven seasons and a TV movie as Alex and three blockbuster adventures as Marty. He was 30, and his film career seemed stalled in shapeless romantic comedies wherein he'd bug out his eyes, execute a masterful pratfall, and get the girl with his manic, vulnerable likability. It was around this point that Fox found out he had Parkinson's Disease. As chronicled in his first book, Lucky Man, plenty of denial and anger followed, along with destructive behavior and self-medication. It wasn't until the middle of the 1990s that Fox was ready to go back to television as an adult and secure his place as a survivor, in more ways than one. The very snappy, smart comedy of "Spin City" was perfect for Fox to anchor as the put-upon deputy mayor of New York City. I always saw it as a companion piece to "NewsRadio" and eventually the much more self-serious "West Wing." The moment we examine today is from a movie that had the blueprints for both "Spin City" and "West Wing" all over it. Written by Aaron Sorkin, the future creator of the White House dramedy, The American President is a light romantic comedy directed by Rob Reiner, and though the bulk of the film lives with the warm chemistry between Michael Douglas's sharp, midwestern schoolteacher turned Commander in Chief and Annette Benning's fierce environmental lobbyist, it also showcases a fabulous ensemble of White House staffers who would eventually be shaped into their "West Wing" counterparts. Among them is Lewis, the domestic policy assistant for the smitten President and kind of a "young Washington" George Stephanopoulos type. As Lewis, Fox seems to be calling out to the rafters of whatever multiplex in which the film screened, "I know I have boyish charm, but I'm a grown man and I need to play grown men on screen now, thanks!" Throughout the film, Fox plays Lewis as a shrewd dynamo on Capitol Hill, a softspoken servant in the presence of his President, and a moral crusader boiling over with outrage in several big monologues. His big moment of the film consists of Lewis lashing out at Douglas's President Shepherd for sitting on fence posts regarding gun control legislation and the recent plummeting of is approval numbers based on his new romance. The scene is a lot more subdued than I usually remember it, with Fox and Douglas raising their voices but never devolving into a screaming match. The conversation seamlessly transitions from the legislation to the President's personal relationship with no real logical turn, but it doesn't have to. This isn't a workplace disagreement, it's an ideological one. Shepherd's refusal for the White House to comment on his relationship has led to his free-falling numbers and his loss of votes on the legislation. Legislation that Lewis has meekly observed throughout the first two acts of the film that does very little to solve crime problems because it is not aggressive enough. This is Lewis, a loyal lackey, telling the most powerful man in the world that he owes his citizens more. Fox gives the speech using an Acting 101 fundamental: he has a goal, and he takes multiple methods and routes to achieve it. He begins with a shaky voice, a palpable lump in his throat. When Douglas shouts down his soft dissent, he explodes back and gestures wildly, but easily comes back to a persuasive, reasonable tone. Eventually, his resolve mounts higher and higher until he begins standing up to the likes of Martin Sheen (as the White House Chief of Staff) and Douglas. Not just with his words and his tone, but his body language. Fox is five feet, four inches tall, so Sheen and Douglas tower over him, but he advances on them and even comes behind the presidential desk of the Oval Office, practically scolding the Commander in Chief. By the end of the speech, the concrete nature of the argument has devolved into pure sentiment, with Lewis openly pleading for Shepherd to display leadership. Fox, all misty eyes and carefully enunciated speech, has made the choice that his character takes this situation personally, not professionally. His level of passion matches the sudden shifts in sentimentality that the character goes through as he decides that he is willing to lose his job over losing his respect for the man he follows. His motivation is clear, and his character, though mostly flippant comic relief at this point, becomes more three-dimensional than some of the larger roles in the film. The American President is very much a fable, a cute parable wrapped in what was quite considerably smart political commentary at the time. Sorkin even namechecks Frank Capra in a line of dialogue. Unfortunately, the film doesn't quite live up to that standard and is mostly remembered as the "President got a girlfriend!" movie that probably looked unintentionally weird a few years later when the real President also got a girlfriend. But if there was a Capra-esque underdog, a Mr. Smith who got to go to Washington, it was definitely Lewis...and Fox himself.